But we know it might still freeze, so everything is being planted with that in mind. 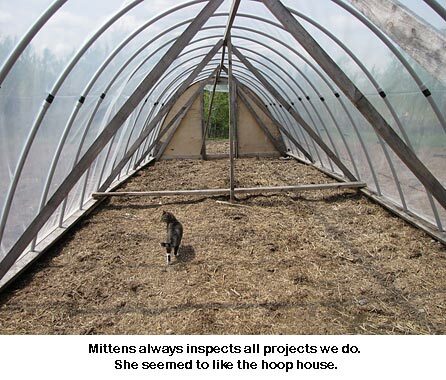 We got the greenhouse plastic up on the big hoop house (12’x32′) and Will and Krystal got the 6-mil plastic up on the small hoop house while I was in Montana. I’ve planted Blacktail watermelon and Sugar Salmon muskmelon in the small house (Will wanted some started inside, also, so that’s done, as well.) 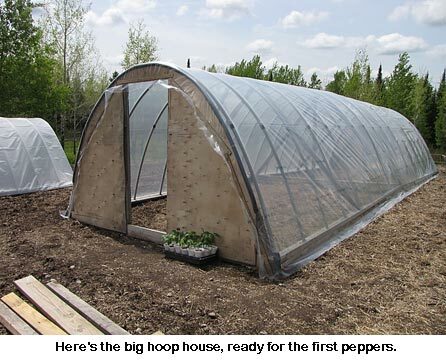 I’m hauling peppers out to the big hoop house where one end will be peppers and I’ll be planting some of the 1,500-year-old beans I brought back from New Mexico. I sure hope they’ll germinate; I haven’t grown them for years. They are a long-season pole bean resembling a runner or lima. I have about 100 beans so we’ll see. 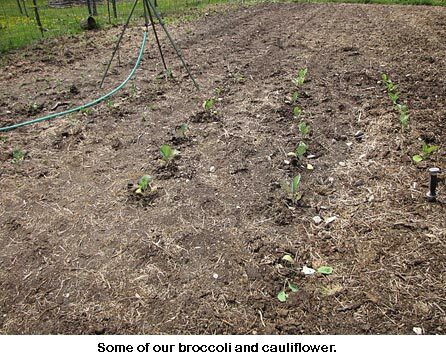 I managed to get the broccoli, cauliflower, and some cabbage planted as well as teach Krystal how to cut up potato sets. We let them sit in the air for a few days so they can heal the wet cuts and start to get green sprouts instead of white ones — they make better and more potatoes that way. I’ve also planted Hopi Pale Grey squash and some new Native squash and pumpkins — direct seeded into the garden. I hope they don’t freeze! They will take about 10-12 days to emerge so we’ll cross our fingers. Will got about half of the siding on the new barn’s west side. It looks great. He also cleaned out the irrigation system for the garden, yard, berry patch, and orchard. What a job! Lots of fine little gravel in the faucets, plugging them up, even though we have a filter on it on the intake end. This happens about every year when we first start up. On Sunday, I roasted a big chicken and we had a wonderful dinner. But there was tons of meat left so I picked it off the bones then boiled the carcass. Yesterday I canned up seven pints and three quarts of chicken, chicken and broth, and plain broth. That’s a whole lot of meals from one chicken!